I love celebrating wonderful mamas, and next up in this series is a fun one! Bridget Collins lives in a charming cottage in Seattle with her husband and three gorgeous boys. 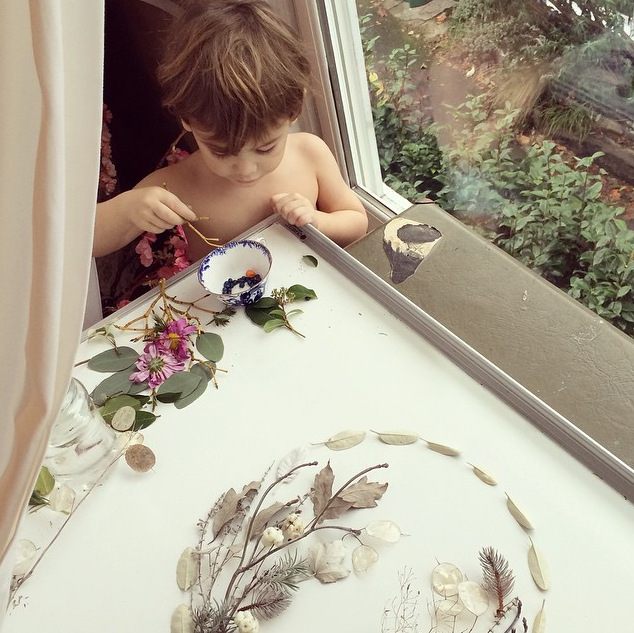 A fountain of creativity, this Mama Bear takes on many artistic roles: writer, poet, painter, forager, and botanical artist (to name a few!). Bridget truly lives wild and free, and her sense of wonder is contagious. I love seeing glimpses of the outdoor adventures she takes her boys on -- especially when she lets them dress up like animals (that shark costume below is my favorite!). If you haven't seen her botanical creations at FloraForager.com or on Instagram, honestly prepare to have your mind blown. Bridget has been an early supporter of Goldpress and you can check out our collaboration here. Keeping sacred what you hold dear. Whether it be your art, children, voice, or self. After my third child came and I realized every baby was completely different and had to be raised differently than the last, I realized there was no need to look to others for a better way. I am the best mom for my children, and they are the best children for me. We make our own way. First I remind myself to breathe because I often find myself holding my breath which causes more anxiety. Depending on the situation I have some favorite phrases: "I am not responsible for other people's reactions." "Treating myself like a precious object will make me strong." And my family's favorite, "it just doesn't matter." As long as I know I am staying true to me and meaning well for others I shouldn't have to be stressed about anything. Snuggles. Making sure they know how uniquely important they are to me. Alone time. I take each of my boys out on dates. And being in nature. I don't care how messy the house is, if we're walking through a forest it's not on my mind. My own mothers. Maybe that's cliche, but the way they shaped my husband and I, and now the way that legacy is shaping our kids, is invaluable to me. Find more Bridget here (Flora Forager botanical art), here (blog & art), and here (writing)!